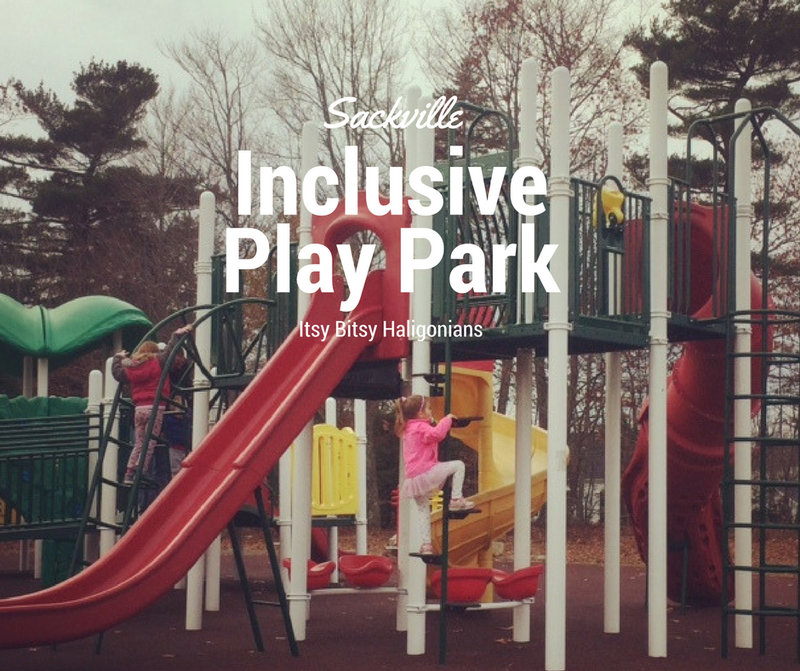 The Sackville Inclusive Playground is located on Sackville Drive, right next to the library. This pretty much make it an ideal location. You get to combine outdoor play with books, all in one outing and in the winter there is also a community rink for skating on! This is an inclusive playground which means a large portion of it is accessible from the ground or ramps so children with mobility challenges can play alongside children without mobility challenges. There are many puzzles, music makers and games on this structure to play with and learn from. There's also a set of these spinners and a ball type thing to climb in and be spun around in. There is also a pretty good sized climbing wall. There is a small slide for the little kids to use, and multiple methods to get to the top of it. There are also three VERY BIG slides, about eight feet high or so. This part states that it is designed for older kids but we all know when little ones see a fun slide and other kids getting to it, they want to try it too. And, yes, that's my daughter, in a tutu, climbing a giant structure. There are no steps to get to them so all access is through various climbing structures that are very high,slightly tricky/challenging and may not be accessible to some parents to support their children going up it. If you have an adventurous kid, they're going to want to go on them - and so will their little sibling. This feature may be a draw or drawback, depending on your parenting style. Miss M (5yo) can navigate the various structures really well by herself now but Mr. M (3yo) still wants me to be right behind him (and I want to be there too) and he's a pretty fearless kid. We've agreed that there's only one method he's allowed up because that's the only I that I can spot him the whole way up. As long as you come with some ground rules and stay aware while they're playing, all should be fine. This playground has become one of our favourites, since it opened last fall and it's close proximity to the library and rest of Sackville's amenities makes it an ideal reason to visit Sackville any time of the year.